RRB Chennai Recruitment 2018: Railway Recruitment Board is the organizations that work for the Indian Government. These recruitment boards manage and provide employment to the eligible candidates to work in the Indian Railways. There are 21 Railway Recruitment Boards spread across different parts of India. 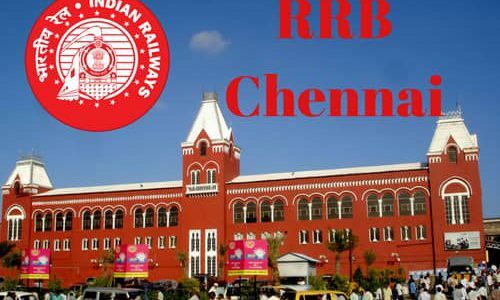 In this article, we are going to provide you with the information about the RRB Chennai. RRB Chennai JE Recruitment 2019 – RRB Chennai is soon goi8ng to announce the RRB Chennai JE Recruitment 2019 on its official website. The recruitment notice is expected to be released on 29th December 2018. The eligibility criteria and complete selection procedure can be checked once the notice is published. RRB Chennai JE Recruitment 2018 will be for about 14,000 vacancies. 02/01/2019 Latest Update: RRB Chennai JE Application Form is released. Click on the link and Fill your Application form before 31/01/2019. RRB Chennai Jr. Engineer Online Form will be active on the official website of RRB Chennai. The candidates are advised to check the eligibility criteria and selection process on the notice before filling the RRB Chennai JE Online Form 2019. The application forms will be available on the official website only. The process is online only Thus no offline application will be considered. 26/12/2018 Latest Update (RRB Chennai JE Recruitment): RRB has released the official notification for RRB Junior Engineer 14,033 posts. The candidates can read the notice in PDF below. 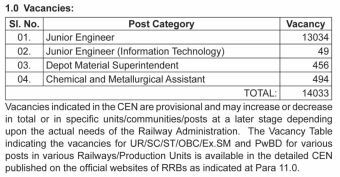 The Junior Engineer Recruitment from RRB Chennai has been released for 14,033 posts. The candidates are advised to check the dates for the RRB Chennai JE Application Form 2019. The Applications will be carried out in the month of January 2019. All the candidates are required to check if they clear the eligibility criteria before filling the application form. Following dates are announced. Railway Recruitment Board of Chennai will soon announce the RRB JE Vacancy 2019 for the candidates. In the official notice for the recruitment drive, candidates can check the RRB JE Vacancy, RRB CDMS Vacancy, and RRB CMA Vacancy. it is advisable to wait for the official notification for the release of the confirmed RRB Junior Engineer Vacancy 2019. Search for the link of notification of RRB Chennai Jr. Engineer. Fill in the details that are required in the RRB Chennai JE Application Form 2019. Update: RRB Chennai Group D Admit Card 2018 will be released on 13th September 2018 by the Railway Recruitment Board of Chennai on their official website. Candidates who have registered can download their RRB Chennai Group D Admit Card by login to the official website tomorrow. The Link to Check the Exam City, Date, Time and SC/ST Travel Pass has been activated today (9.09.2018). The Link is available on all the Official Regional RRB Websites. The Link will stay activated from 14:00 Hours of 9th September 2018 for the candidates who have been scheduled for 17th September 2018 to 16th October 2018. For the remaining candidates, the link will be live from 13th September 2018. The Railway Service Commission in January 1985, renamed to Railway Recruitment Boards. The Railway Recruitment Boards (RRB) are the organizations that work with the Government of India. These recruitment boards manage and appoint new employees to work in the Indian Railways. There are 21 Railway Recruitment Boards spread across different parts of India. In this article we are going to provide you the complete details on RRB Chennai Latest Job Notifications, Eligibility Criteria, Selection Process, Application Process, Salary Structure, checking Application status, Admit cards and Result Notification. The Railway Recruitment Board (Madras) now known as Chennai functions under the Ministry of the Railways, Government of India. It is primarily responsible for recruiting the “Group C” staffs. These staffs are recruited for the Chennai, Salem and Tiruchirappalli Divisions and the Head Quarters Office of Southern Railway and Integral Coach Factory (ICF) Chennai. The Railway Recruitment Board of Chennai has released notifications for various Technical and Non- Technical Posts in September 2017. There will be quite a heavy vacancy for the posts. The starting dates for the online application is 28th Feb 2018 and the end dates of the application submission are 31st March 2018. The Department of the Railway, Government of India said that the application process is held online and the examination will also be conducted online. This online exam will be recruiting approx. of 2.5 Lakh of the manpower. The recruitment process will be conducted in two phases. RRB Chennai has already released RRB ALP Admit Card 2018 for First Stage CBT. The RRB Chennai Admit Card will be released 4 days before the date of the examination. The Railway Loco Pilot Admit Card of RRB Chennai will be released online only. The RRB Chennai ALP First Stage CBT has been started from 9th August 2018 to 31st August 2018. The RRB Chennai will release the RRB Loco Pilot Admit Card 4 days before the date of the examination. Candidates can be able to download the RRB Assistant Loco Pilot Admit Card by entering their Registration Number and Date of Birth. The Railway Loco Pilot Admit Card is a mandatory document that has to be carried by the candidate. The RRB Chennai ALP First Stage CBT Hall Ticket will carry all the important details about the candidate and examination. RRB Chennai Group D Admit Card will be released online on the official website of the RRB Chennai. The RRB has not declared any dates for downloading RRB Group D Admit Card. The Railway Group D First Stage CBT can be downloaded by entering User ID and Date of Birth. RRB Allahabad will release the RRB Admit Card 4 days before the date of the examination. Candidates will be notified regarding the Railway Chennai Group D Admit Card 2018 on their registered mobile number and e-mail id that they have submitted during the Registration. The Railway Chennai Group D Hall Ticket will be available online only on the official website of Indian Railways – www.indianrailways.gov.in. The RRB Chennai Admit Card is a very important document that must be carried to the Examination Centre. It serves as an Identity Proof for all the candidates. No candidate will be allowed to enter the Examination Hall without an RRB Chennai Loco Pilot Admit Card 2018. RRB Chennai has released notification for the Assistant Loco Pilot (ALP) Posts. The date for applying for the posts will start from 3rd Feb 2018 and the last date to apply is 5th March 2018. The pay- scale of RRB Chennai ALP and Technician is Level 02 of 7th CPC Pay Matrix with an initial payment of Rs 19, 900/- plus the other allowances as admissible. After submitting the online application, it is necessary to check the application status. Only those candidates can view their application form is accepted by the Recruitment Board can sit for the examination. To check the application status is quite easy. All you have to do is visit the official website of the RRB Chennai and search for the Application Status link. Click on the link and enter the details like the Application Reference Number and the Date of Birth and click on the Search option. It will provide you the complete update of the current status of your Application Status. The Admit Card for RRB Chennai ALP 2018 issued online only. You will have to download the admit cards from the official website only. It is mandatory to download the admit cards. If you do not download the admit cards then you will not be able to appear the examination. The admit card serves as an Identity proof for the candidates. The admit cards are not issued to those applicants who haven’t paid their application fee. The Result of the RRB Chennai ALP 2018 online exam will be uploaded to the official website after the evaluation of the mark sheet. The result will be uploaded after 2 months of the exam on the official website. RRB Chennai has released Official notification for Railway Group D Recruitment 2018. Railway Board indicates total 62907 vacancies for various Grade IV posts in Level-I of 7th CPC pay matrix. RRB Chennai invites Online Application Form eligible candidates for the Posts – Track Manager (Trackman), Helpers, Gateman and Pointsman under RRB Chennai CEN 02/2018. The details of the recruitment notification and the online application will be uploaded to all the 21 RRB Official websites. The Online Application for Railway Group D Recruitment 2018 starts from 10th Feb 2018 and the last date of filling the online application form is 12th March 2018. So, if you are preparing to get into the Railway Jobs, then you are at the right place. Relaxation in the upper age limit will be applicable for the Reserved Category students. The details regarding the Relaxation criteria will be notified of the detailed version of RRB Chennai CEN 02/2018. The candidates can apply for Railway Group-D posts online on the Official Website. A separate website will be launched for the application of this Recruitment. The application link will be updated in the respected RRB Chennai official website. Each website of the zones and divisions will have separate apply online links. The RRB Chennai Group-D Online Application 2018 Link will be available as per the schedule. The reserved category candidates must note that their application fee of Rs 250/- will be refunded after deducting the bank charges after they have appeared for Computer Based Test. After the submission of the online application form, the candidates will receive the login details. With the help of these login details, the candidates will be able to download the admit card of RRB Chennai Group-D Examination. The admit card will contain all the details of the exam such as the exam date, time and center. Through the admit card only, the candidates will get to know their exam centre. Without an admit card, the candidates will not be allowed to sit in the examination. The admit card is the mandatory document that must be taken in the examination. Thus, it is very important to download the RRB Chennai Group D Recruitment Admit card 2018 and take the printout of it. The admit cards will be available 10 to 15 days before the examination date in the respected RRBs Official website.